In conjunction with Our HR Company and the Department of Social Services, we are proud to release The Australian Way, a customised Shareable App produced on the platform to assist refugees and migrant services in providing a digital engagement and comms tool. The Shareable Apps team thoroughly enjoyed working on the project and would like to congratulate Margaret Harrison, MD of Our HR Company, Animations: Cameron Mcmillan from Freeform Creative, Daryl Turner Creative, Kate Richie and the team from Chin Translation Services, Carmen Garcia, MD of Community Corporate and Raj Subramanian, aBi Speedy Printers. We would like to extend a special thanks to Roger Phillips, Senator Jane Hume for presiding over the launch, our settlement service provider partners AMES and SSi, and all members of the DSS who assisted with the app. The Australian Way Shareable App utilises a wide range of unique functionality built into the platform. This includes a range of interactive content delivery modules for video, training, communications, multilingual capabilities, learning modules, resume builders, compatibility across all mobile platforms, dynamic updating and customised reporting. We look forward to continuing to assist the department and the users of the app to achieve their employment aspirations in Australia. Here is the official press release from Senator Jane Hume. We’re proud to be involved in another world-first and strongly believe this is a great use of our home-grown patented technology to improve the lives of people in need. Working-age humanitarian entrants and refugees will now have cutting-edge support in finding jobs thanks to an innovative app funded by the Australian Government. Our HR Company will receive $1.2 million through the Try, Test and Learn Fund for a trial aimed at improving work readiness and employment outcomes for humanitarian migrants. Announcing the trial on behalf of the Government at a Harmony Day event in Melbourne, Senator Jane Hume said The Australian Way will assist 500 humanitarian entrants and refugees across New South Wales and Victoria over the next 16 months. “The Australian Way will help humanitarian entrants and refugees feel welcome in this great country of ours by providing an innovative, engaging digital platform to accelerate their potential employment outcomes. 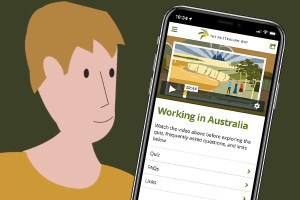 Using animated storytelling, the app will offer participants an understanding of the Australian workplace and the tools needed to get a job,” Senator Hume said. The app will help participants prepare resumes and job applications, access other job-seeking support and encourage attendance at English language classes. “We hope this new project will support refugees and humanitarian entrants to get a good understanding of our workplace cultures and expectations and how to go about looking for work,” Senator Hume said. The Australian Way will be presented in English and translated into four of the most commonly spoken languages of participants – Arabic, Assyrian Neo-Aramaic, Dari and Chin Hakha. Our HR Company Managing Director Margaret Harrison said while many migrants and refugees find work within the first few years of arriving in Australia, a small group continue to struggle. “Our team is proud to be working on The Australian Way to help those who are finding it tough to secure their all-important first job in Australia. Sometimes a new approach is needed. “Many refugees come to Australia ready to find work, earn money and make a better life for themselves. The interactive app will also let more ambitious and motivated participants work through the content at their own pace and accelerate their employment prospects. It has great potential to assist many more refugees in the future,” Ms Harrison said. The Australian Way is one of a number of trials for working age migrants and refugees delivered through the $96.1 million Try, Test and Learn Fund, which aims to trial new or innovative approaches to assist some of the most vulnerable in society onto a path of stable, sustainable independence. For more about information about The Australian Way, visit dss.gov.au.